A look at interim coaches, ending streaks, and whatever Purdue is doing. Remember when Kevin Sumlin was a genius and seemed destined to be an NFL coach someday? At different times, the former Texas A&M coach was rumored to be the next coach of the Dallas Cowboys and the Philadelphia Eagles. That was in 2016. It seems like a lifetime ago. Among the Pac-12 hires in the state of Arizona, Sumlin taking over Arizona seemed like a better fit that Herm Edwards going to Arizona State. Well, things aren’t going according to script. Sumlin has been a colossal disappointment. Despite already having a Hesiman Trophy candidate at quarterback in Khalil Tate, Sumlin curiously hasn’t been unable to harness Tate’s ability. The dual-threat QB has 15 carries for 22 yards and a TD score, while passing for 538 yards and one TD to two INTs. Last season, he rushed for 1,411 yards and 12 scores while passing for 1591 and 14 TDs to nine picks. Tate’s strength is clearly his running ability and yet, Sumlin refuses to let him carry the ball. Part of being a good coach is adapting your system to the talent available, Clearly, Sumlin isn’t doing that. 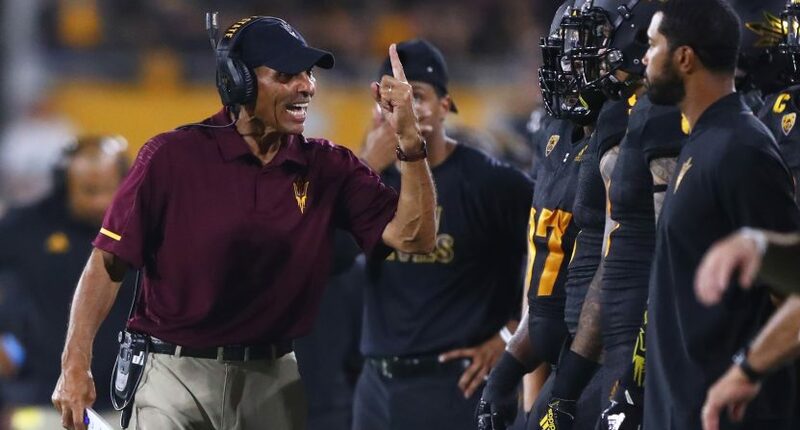 Arizona State was mocked – and justifiably so – for hiring Herm Edwards. The former ESPN analyst hadn’t coached in college since 1989 and his NFL record was 54-74. Perhaps apologies are in order. Arizona State upset then-No.15 Michigan State 16-13 at Sun Devil Stadium last week. The big surprise has been the defense, which has allowed a total of 20 points. It limited Michigan State’s rushing attack to 63 yards. Last year, Arizona State surrendered 177.5 yards per game on the ground. Under defensive coordinator Danny Gonzales, the Sun Devils lead the country in rushing defense at 32.5 yards per game. We’ll find out a lot more about Arizona State over the next few weeks. The next two games are on the road against San Diego State (1-1) and the Pac-12 opener at conference favorite No. 10 Washington (1-1). Even if they lose to the Huskies, there’s a good chance that Arizona State could open the season 4-1. That’s big considering that the Sun Devils were picked to finish last in the Pac-12 South Division. The Seminoles are among the worst looking 1-1 teams in the nation. And they haven’t even played on the road yet. They lost 24-3 against Virginia Tech in a game where new coach Willie Taggart accused the Hokies of faking injuries to slow down his offense. Last week, they trailed by as many as 13 to FCS Samford and were behind 26-21 in the fourth quarter before rallying 36-26. The honeymoon is already over for Taggart. He’s third on coacheshotseat.com. Florida State was picked to finish second in the ACC’s Atlantic Division. There’s plenty of time left for Taggart to right the ship, but what is this team going to look like when it plays Miami and Clemson next month? The running game has mustered just 114 yards per game (No. 107 in the nation). Slow starts are nothing new for Taggart. He was 2-10 in his first years at Western Kentucky and South Florida before big turnarounds. (He did go 7-5 at Oregon last year). Unfortunately for Taggart, he can’t afford to have a losing record in his first year at Florida State. This is habitually one of the toughest jobs in college football. Whenever the Wildcats are 2-0, it’s time to celebrate. Mark Stoops is in his sixth year, and should qualify for hazard pay for lasting that long. Stoops has only posted two winning seasons, but both have been in the past two seasons (back-to-back 7-6 years). Could this be a major breakthrough for Kentucky? The Wildcats just beat then No.25-Florida 27-16 to end one of the longest streaks of futility in college football. They had lost 31 straight to the Gators and impressively won in The Swamp. Kentucky hadn’t been victorious in this series since, egads, 1986. With the next three games at home, Kentucky could start 5-0 (Murray State, No.16 Mississippi State and South Carolina). All-SEC tailback Benny Snell (nation’s fourth leading rusher at 150 yards per game) gives the Wildcats and identity. Is the Florida win a turning point? Well, in 2011, coach Joker Phillips broke a 26-game slide to Tennessee. It didn’t signal the beginning of a new era. But for now, Kentucky fans can rejoice. The Boilermakers weren’t expected to be a major factor in the Big Ten, but it opened the season with winnable games at home. Losing a close one to Northwestern is one thing, but falling to Eastern Michigan 20-19 is another. Where is the offense (23 points per game)? Jeff Brohm is one of the best offensive minds in football. The basic problem is that Purdue doesn’t seem to have a quarterback and all of Brohm’s scheming can’t cover that up. Junior Elijah Sindelar and senior David Blough both played against Eastern Michigan, and were a combined 14 of 24 for 135 yards with a TD. Yikes. With their first four games in West Lafayette, Purdue seemed poised to build momentum. But if it drops games against Missouri (2-0) and Boston College (2-0), the season might be a lost cause. At least Brohm has one player he can count on. Freshman Rondale Moore is seventh in the nation in all purpose yards per game (188) and has scored a rushing TD and a receiving one. Big Ten programs with interim coaches are undefeated. Ohio State (2-0) isn’t surprising, but Maryland is. DJ Durkin remains on administrative leave following allegations of abusive treatment of his players. He might not survive. Unlike Urban Meyer, Durkin is expendable. Acting coach Matt Canada has led Maryland to victories over then-No. 23 Texas and at Bowling Green. Maryland could open 4-0 with before an Oct. 6 trip to Michigan. This week, Maryland received votes in the Associated Press Top-25 poll. That’s progress because Maryland has struggled to find footing in the conference since joining the Big Ten in 2014. Canada will lead the team this Saturday in what figures to be an emotional home opener. Maryland will have a moment of silence before the kickoff to remember the late Jordan McNair. His No. 79 will be displayed in a large circle behind one end zone.